Nowadays, all bicycles are designed with an adjustable handlebar. 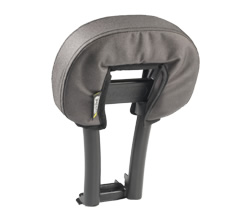 This lets your child sit further back from the steering. However, to offer a handhold, Bobike has developed a special handlebar with cushion. The handlebar with cushion gives your little one extra support, if he should fall asleep for example. The fabric of the cushion is soft to the touch meaning increased comfort as well as safety for the child traveling at the front of the bicycle. The Bobike handlebar is attached between the two attachment pins of the Bobike mini.